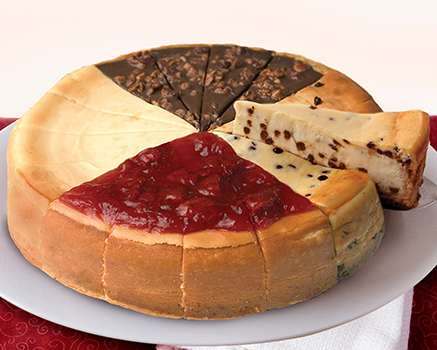 Four slices each of our Original Plain Cheesecake (Chicago's favorite dessert! ), Apple Streusel Cheesecake and Cherry Linzer Cheesecake, both made with the finest Michigan fruits. INGREDIENTS: Cream Cheese (Pasteurized Milk and Cream, Cheese Culture, Salt, Carob Bean Gum, Guar Gum), Sugar, Sour Cream (Cultured Nonfat Milk and Cream, Corn Starch, Whey, Guar Gum, Carrageenan, Carob Bean Gum, Enzymes), Wheat Flour, Egg, Butter (Cream, Salt), Powdered Sugar (Sugar, Corn Starch), Modified Corn Starch, Vanilla Extract, Egg Whites, Salt, Soybean Oil, Soy Lecithin. INGREDIENTS: Cream Cheese (Pasteurized Milk and Cream, Cheese Culture, Salt, Carob Bean Gum, Guar Gum), Tart Cherries (Cherries, Sugar), Wheat Flour, Sugar, Butter (Cream, Salt), Sour Cream (Cultured Nonfat Milk and Cream, Corn Starch, Whey, Guar Gum, Carrageenan, Carob Bean Gum, Enzymes), Egg, Brown Sugar, Powdered Sugar (Sugar, Corn Starch), Modified Corn Starch, Egg Whites, Vanilla Extract, Salt, Carrageenan (Carrageenan, Dextrose), Natural Color (Vegetable Juice), Soybean Oil, Soy Lecithin. INGREDIENTS: Cream Cheese (Pasteurized Milk and Cream, Cheese Culture, Salt, Carob Bean Gum, Guar Gum), Apples, Wheat Flour, Brown Sugar, Butter (Cream, Salt), Sugar, Sour Cream (Cultured Nonfat Milk and Cream, Corn Starch, Whey, Guar Gum, Carrageenan, Carob Bean Gum, Enzymes), Egg, Powdered Sugar (Sugar, Corn Starch), Modified Corn Starch, Water, Egg Whites, Vanilla Extract, Pectin, Salt, Ground Cinnamon, Soy Lecithin.